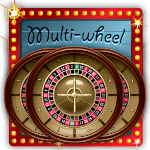 If more wheels means more excitement, then multi-wheel roulette is up to eight times as exciting as regular roulette. As you may have worked out, this is because multi-wheel roulette allows you to spin as many wheels at once as you like, up to a maximum of eight. This variant uses a standard European Roulette layout, with just one zero, and the number of wheels involved varies from site to site. Some will allow you to choose how many spin at once and others will have a fixed amount, while some will have a maximum of eight and others might have a lower maximum. Predictably, Canadian roulette players have only been able to play this variation since the birth of online roulette. In short, it would be impractical to bring multi-wheel roulette to the live arena (though it might be amusing to watch someone try). Although it might not have been the quickest to catch on, the popularity of multi-wheel roulette means it can be found at most online casinos available to players from Canada in 2019. As online casino technology has progressed over the years, more and more roulette sites have been able to offer visually pleasing multi-wheel roulette games with impressive graphics and seamless gameplay. However, the difference comes from the fact that each bet is active across all of the wheels involved in each spin. So if you bet on a single number and you are using eight wheels, you will win whenever the ball lands in the winning slot on any single one of those wheels. Of course this means you can win on one wheel and lose on others, but a high-paying win on one can leave you in profit for that round even if your bets lose on the majority of the wheels in play. The best way to approach multi-wheel roulette online is to think of it as if you are playing multiple separate games of European Roulette. Rather than payouts being divided by the number of wheels, each one of the wheels pays out separately, so essentially you are making one bet per table each time. This is something you need to keep in mind when placing your bets, as it's important to realize a $5 bet in theory will be $40 worth of bets in practice if you are playing the maximum of eight wheels. However even if you are placing an even money bet, such as red or black, you just need five of those eight to come good in order to turn a profit on that particular spin. And of course if a straight-up bet of $5 hits on more than one wheel, the return on investment can be huge. As we have explained, multi-wheel roulette is a relatively new addition to the Canadian online roulette landscape. Due to the experience of our team of reviewers, they will remember the first time they saw the multi-wheel roulette option show up on their casino of choice, and they have witnessed first-hand how the variant has developed over time. If you are coming to online roulette for the first time in 2019, you will soon realize that as a player from Canada the choice can seem overwhelming. Thankfully our review team has identified the best sites to play multi-wheel roulette in 2019 to make the decision on where to make your first deposit that much easier. How does Multi-Wheel Roulette work? Multi-wheel Roulette is a very exciting game of high-speed action. Players can choose to play many wheels at one time - sometimes as many as eight wheels at a time. That means eight times the winning action. The wheel layout is that of a European game, with only one zero. Players can also anticipate multiple wager amounts to make playing even more fun and accessible. Because multi-wheel Roulette utilizes the European variety, the same bets and table layout are also used. The only difference between multi-game and single game Roulette is that you can be spinning more than one wheel at a time, and multiplying your chance of winning. Like all online Roulette games, you can anticipate a much wider variety of wager amounts - sometimes as low as a one-cent piece. Like all forms of online Roulette, Canadian players love it. One of the primary reasons it is so popular online is that it is not available at land casinos. Good news: because it is online, you will never have to wait in a long line at the casino in order to play. Multi-wheel Roulette is different because you can spin sometimes up to eight wheels at one time. That means that you can be winning ultimately eight times your wager should your bet win. This variety of play is much like the multi-line games of video-poker. When you win big, you win really big. The odds are actually the same with online multi-wheel Roulette as with European Roulette at a brick and mortar casino, or a single wheel game online. The difference in the winnings comes in the fact that when you win, it is eight times the win. You will still wager one bet. You can use a Roulette system of play. Many people adhere to the Martingale system because it has been tested against many table game varieties over the years, and many believe it works well. However, this type of system really does require a much larger bankroll in order for it to really work. Because you will be having up to eight wheels at once, the likelihood of keeping track of every number coming up is a bit extreme. There is also the reality that the RNGs - random number generators - are randomly selecting the numbers that show on the wheels. The best system is always to play within your bankroll means and stick to a betting pattern that reflects no more than 3% of your total bankroll on any given bet. The longer you can play, the greater the chance of winning real money. Our team of Roulette experts and multi-game Roulette lovers have located some of the best online venues for your enjoyment. With high rates of return, great bonuses, multiple deposit and payout methods, and supreme customer service, you can start playing today.